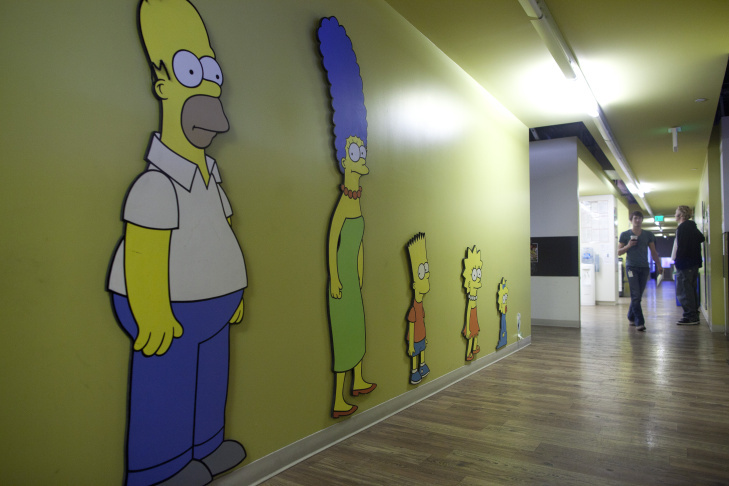 "The Simpsons" characters line one of the hallways inside the animation studios of the show in Burbank. 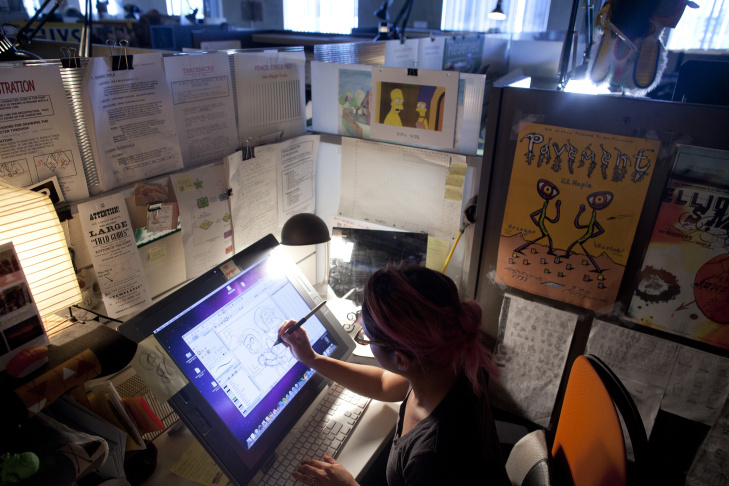 Debbie Mahan is a character layout artist for "The Simpsons." 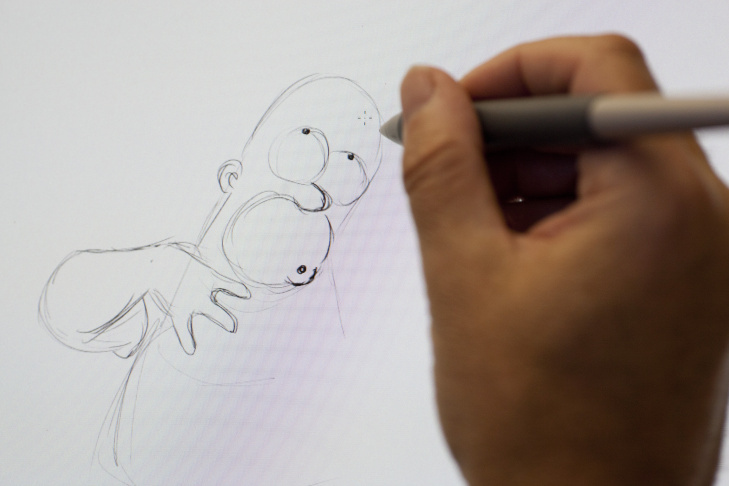 David Silverman draws Homer in Photoshop at the "The Simpsons" animation studio in Burbank. 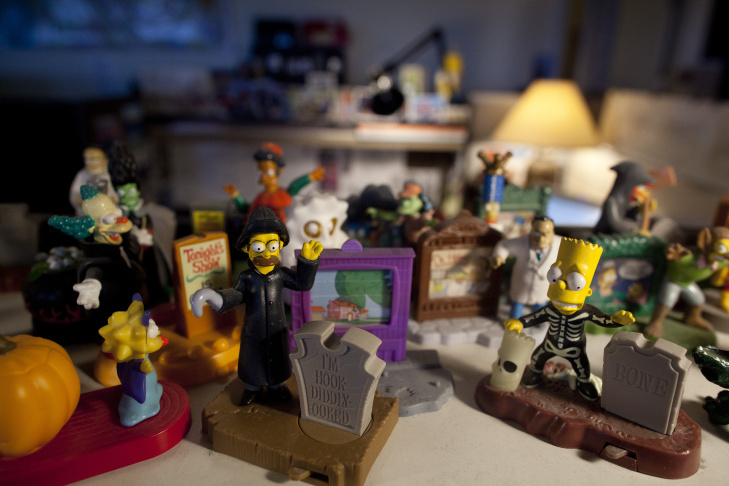 Figures of "The Simpsons" characters sit atop a book shelf in the offices for the show in Burbank. Before converting to digital, folders contain sheets of drawings of models for characters in "The Simpsons." 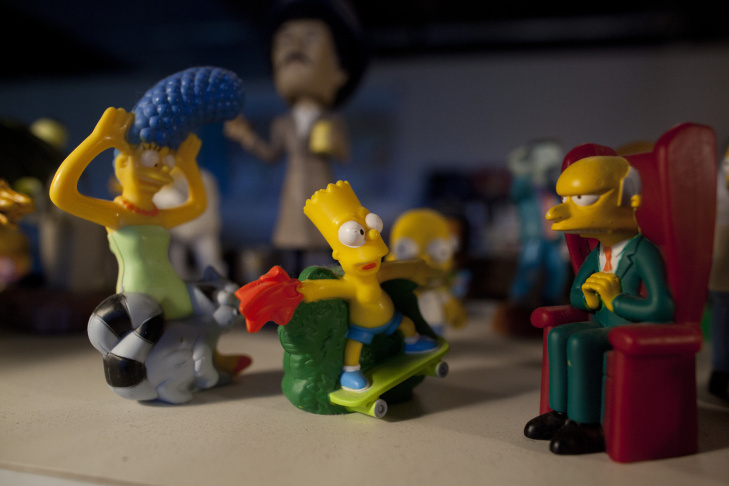 Figurines of "The Simpsons" characters line the bookshelf of one work station at The Simpsons studio in Burbank. 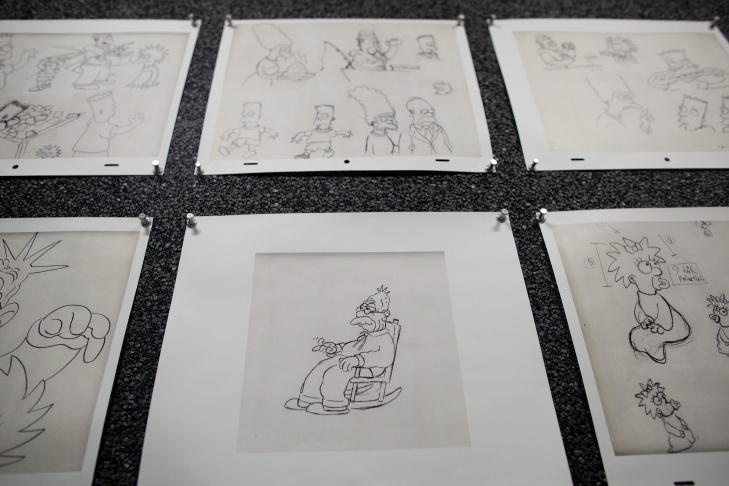 Sketches of various scenes on the wall of an animator's cubicle at "The Simpsons" studio in Burbank. 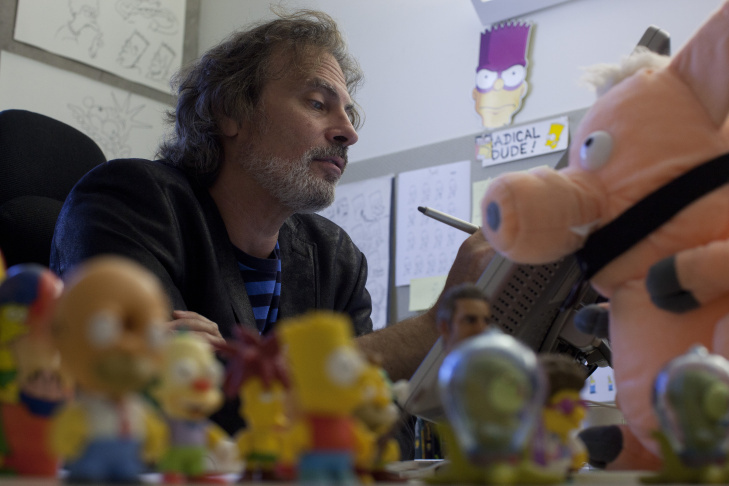 David Silverman, a director and producer of "The Simpsons," draws in his office at the show's animation studios in Burbank. The animation studio for "The Simpsons" is in Burbank, but two studios in Korea touch up much of the work to make it consistent with the models of the characters. 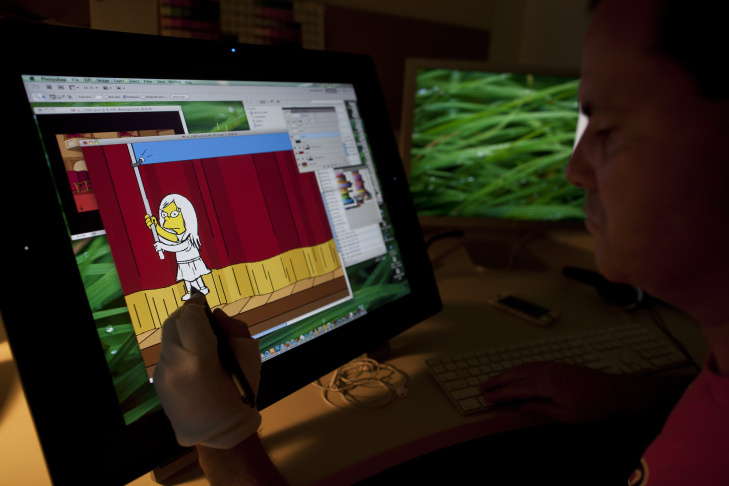 Eli Balser colors a scene from an upcoming episode of "The Simpsons." One of the cubicles at the animation studio for "The Simpsons" in Burbank. Sketches on the walls of a conference room depict different characters in "The Simpsons." 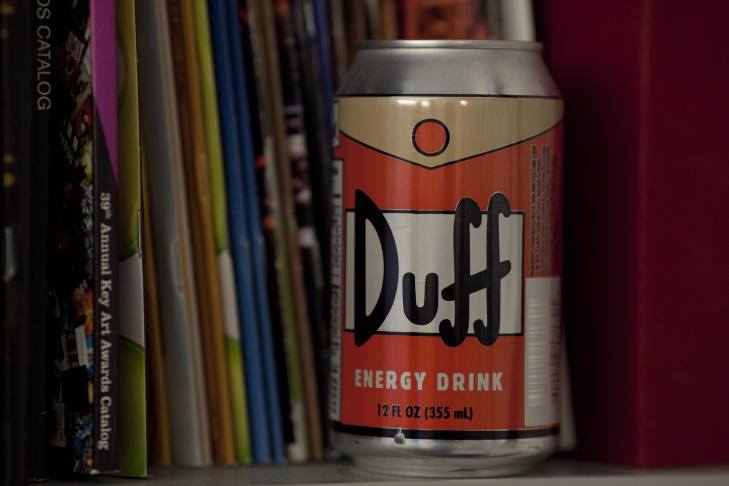 An icon from "The Simpsons" comes to life in the form of an energy drink. 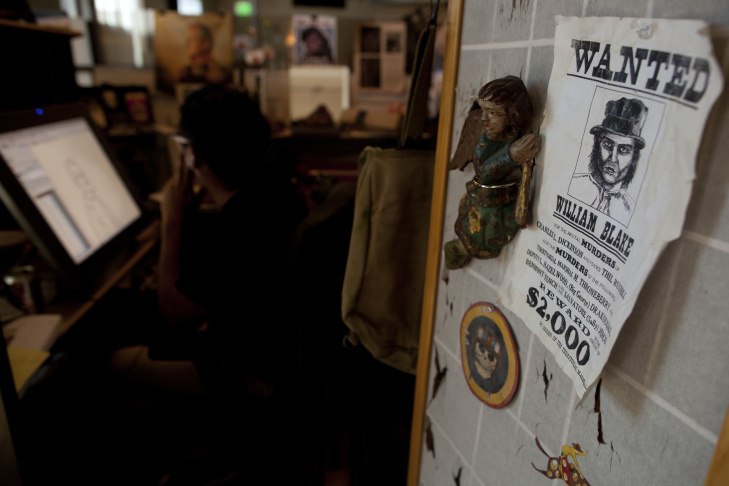 An animator's work station at the studio in Burbank. 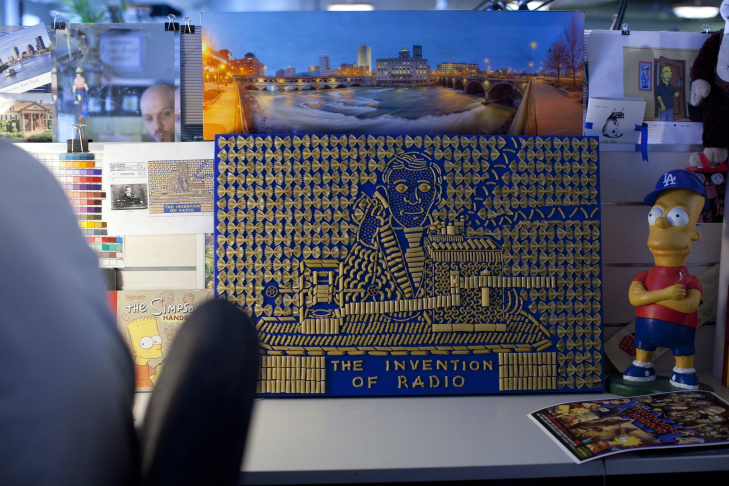 Various decorations adorn the work stations at "The Simpsons" production studio in Burbank. 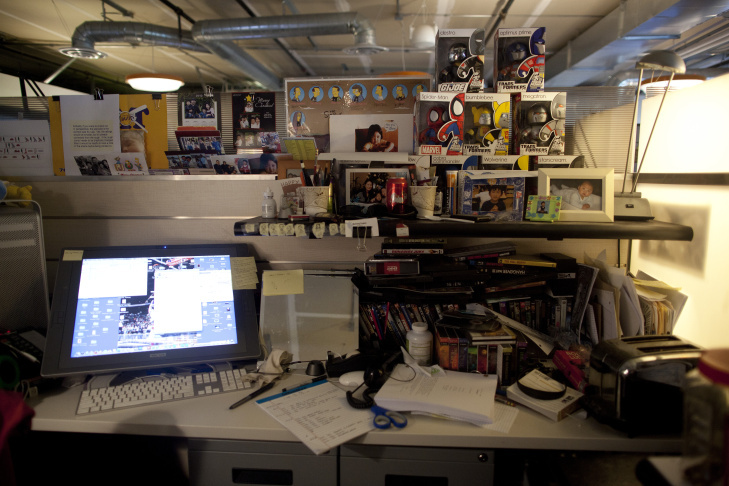 Post-it notes with sketches line the wall of Tuan Nguyen's work station at "The Simpsons" studio in Burbank. 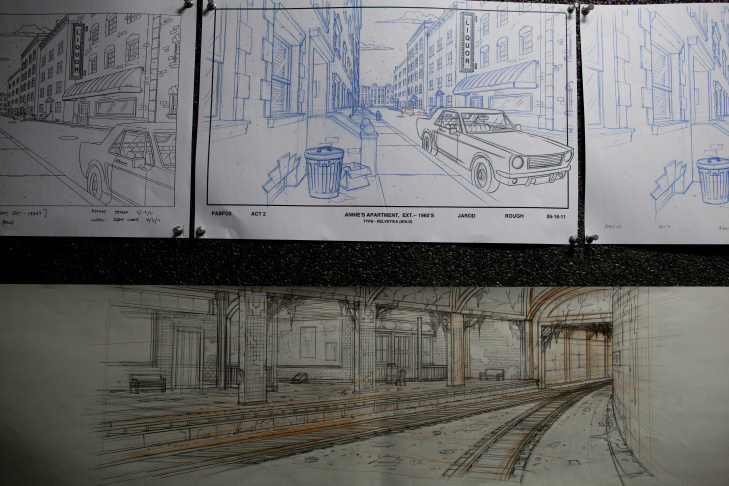 Drawings depict one part of the animation process for "The Simpsons" at the studio in Burbank. 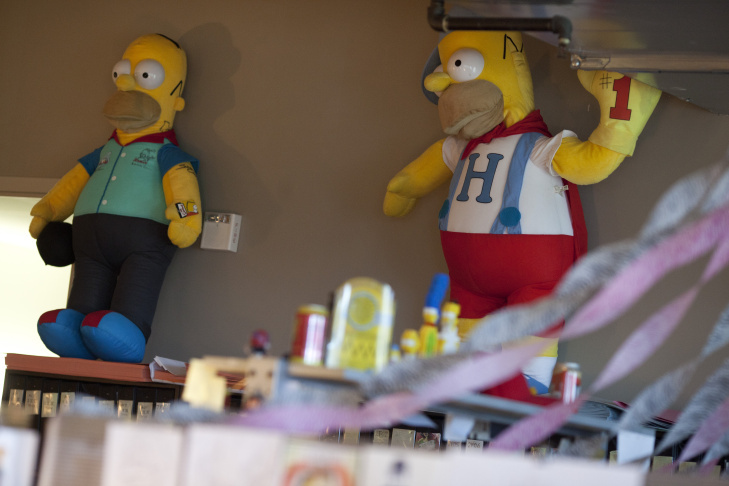 Stuffed Homers sit atop a bookshelf at the animation studios of "The Simpsons" in Burbank. 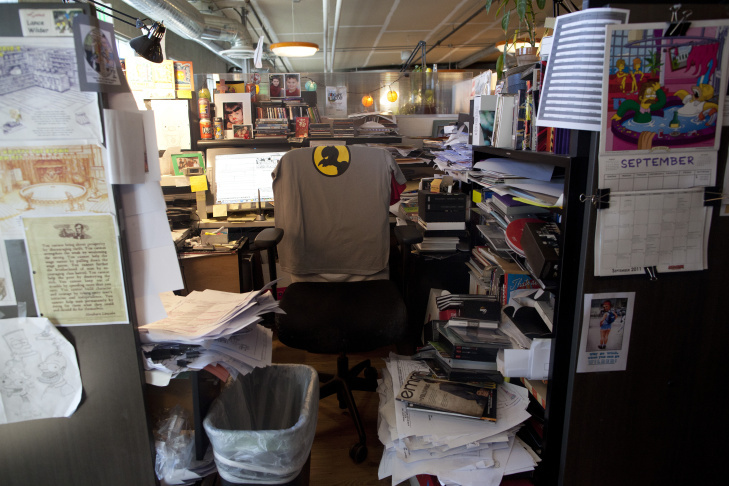 An animator's cubicle at "The Simpsons" studio in Burbank. "The Simpsons" premiered its 26th season on Sunday — an anniversary worthy of cracking open some Duff beers and downing a Squishee. To mark the occasion, our friends at Vulture combed through the quarter-century of seasons to create the definitive list of "The 100 Best 'Simpsons' Episodes." This will be a handy guide when the entire "Simpsons" oeuvre becomes available soon via an FX mobile app. According to one early anticipator at Quartz, Simpsons World could change your life — or keep you distracted for hours. The Frame's John Horn spoke with Vulture's Jesse David Fox about some of his favorite "Simpsons" episodes. 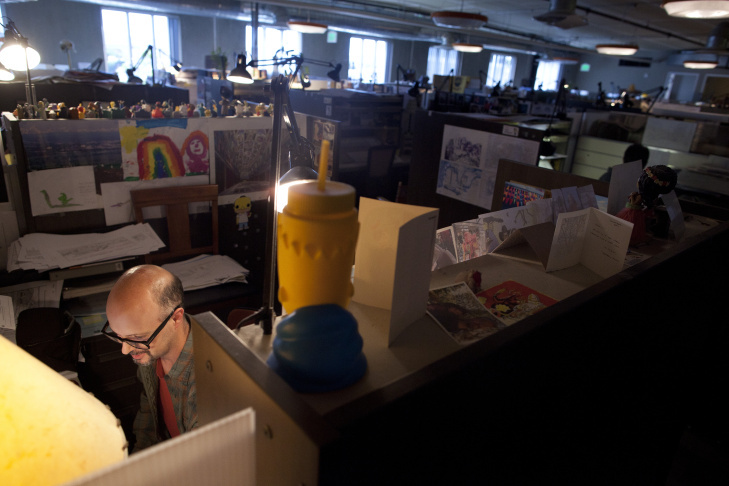 And we sent KPCC's photojournalist Benjamin Brayfield to visit "The Simpsons" animation studio in Burbank to photograph where the magic happens. 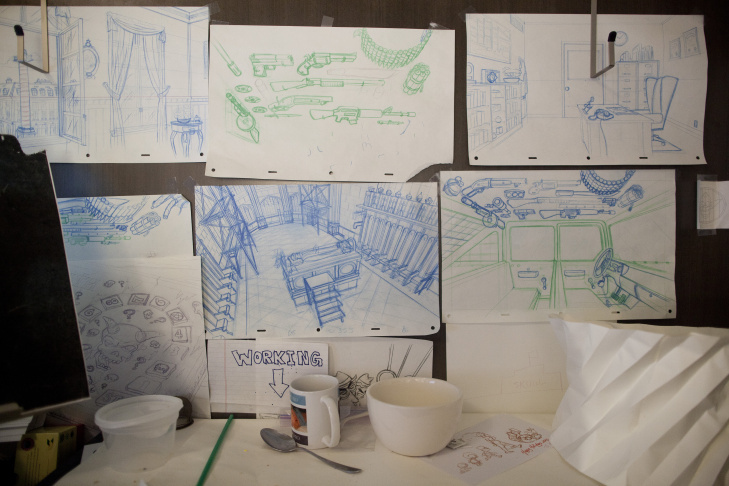 In this slideshow we go inside the yellow halls and cluttered work stations to see the creative spaces of those who draw "The Simpsons."